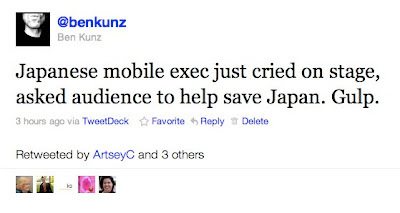 As the sorrow sweeping Japan deepens, we grow speechless. Today at the SXSW Interactive conference we watched a panel of several Japanese mobile business executives talk about trends in wireless. The big takeaway from Japan, which of course leads much of the world in technology adoption, is social media dynamics are becoming embedding in almost everything: games, photos, music, books, anything that could be digitized and shared with your human network in a Charlene Li like-air way. Afterward we had lunch with Edward Boches, who shared another panel’s concept of lowering international shipping operation costs by giving end consumers point systems as reward for offloading their orders from peak “Black Friday” demand periods, which would even shipping cycles, save energy, shave pollution, and potentially become a source of retailer “green” bragging rights. The stories of technology knitting humans together continue here at SXSW. 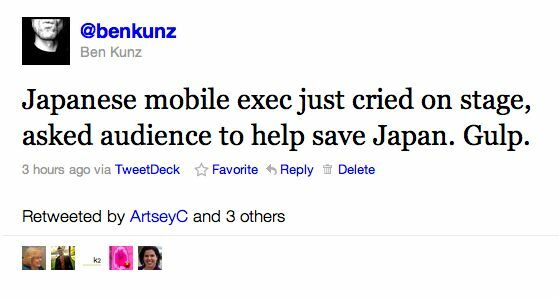 But nothing builds a community faster than seeing a real live human being, a Japanese mobile executive, ask for help with tears running down his face on stage. The world is connected like never before. I was in a session re social in the Middle East with Jennifer Preston of the Times and Andy Carvin of NPR when it became apparent via Twitter that Al Jazeera cameraman Ali Hassan Al-Jaber had been killed. In real time, while the conversation went on, Carvin verified sources and informed that room that the reports were, in fact, true. My name is Neccia Celli and I work for Newstex.com. We’ve reviewed Thought Gadgets, and think it might be a good fit for syndication with Newstex! If you’re interested in learning more, please send me a message at ncelli@newstex.com.